Belgrade is capital of Serbia. 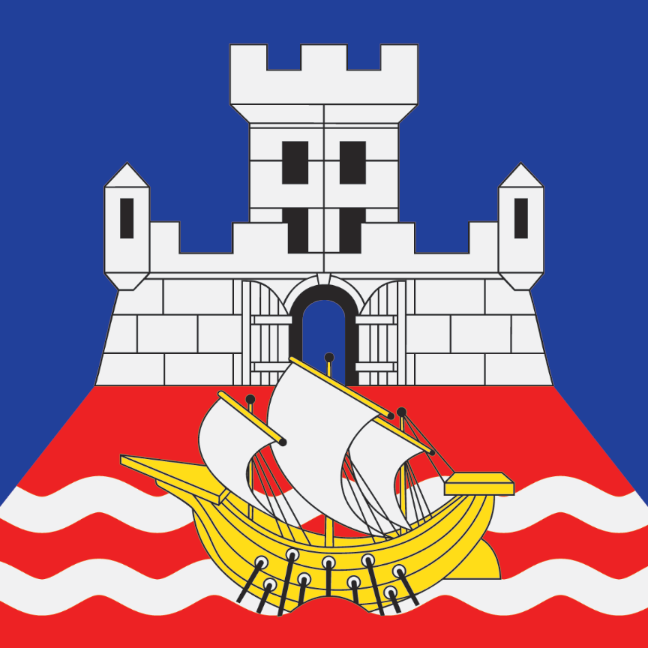 City of Belgrade has its own official symbols: flag and coat of arms in three levels. The usage of correct flag is matter of pride. Usage approval is not necessary, but incorrect and improper usage and misuse which insults dignity of Belgrade citizens will be penalized. Therefore, previous consultation is recommended. 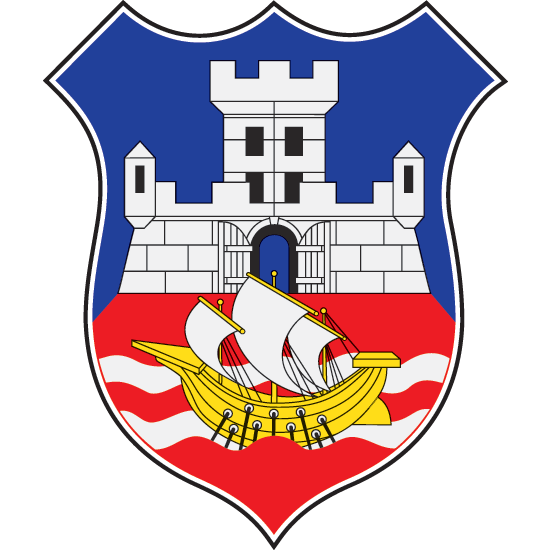 The Belgrade coat of arms must be shield-shaped, slightly pointed at the bottom. The elements of the coat of arms: national colours, a river - as a symbol of primordial power of Belgrade, a Roman galley (trireme) - as a symbol of antiquity of Belgrade, white walls with a tower and an open gate - the walls represent the settlement, the tower represents the city, and the open gate represents free communication. Middle arms of Belgrade is shield crowned with golden mural crown decorated with diadem and six visible merlons. 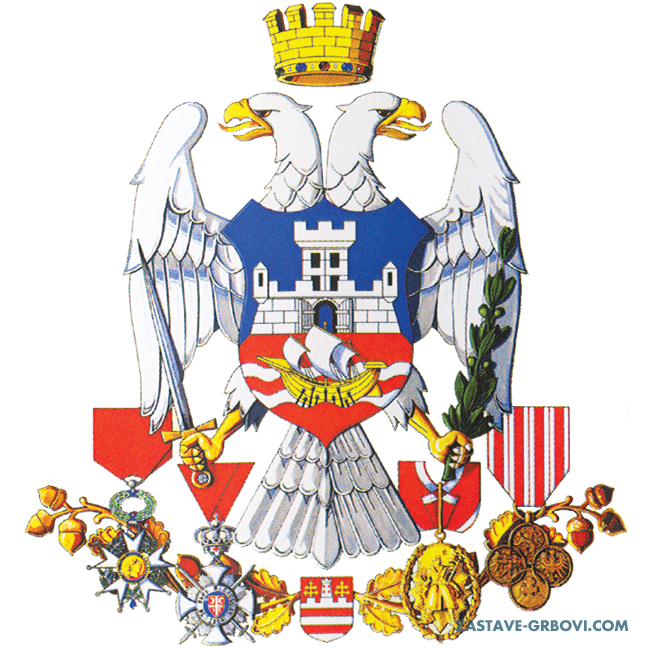 Greater arms of Belgrade is shield placed on chest of white two headed eagle crowned with golden mural crown. Glas Javnosti - "Expression of consciousness and pride of nation"
Stamps album "Arms of Yugoslavia" (issued by "Kava Hag d.d. ", Zagreb, 1939.) illustrates Belgrade arms shaped in a different fashion than in conclusions of munipal comitee from 1931. 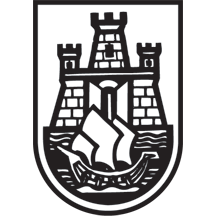 Former emblem (until 1991) had same motifs, but was stylized as black and white logo. 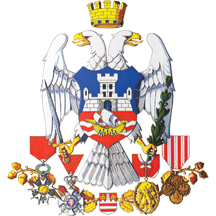 About Belgrade Coat of Arms and Flag at official web site of the city. 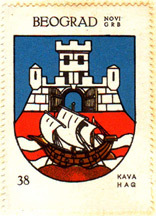 Variant of Belgrade arms from album "Arms of Yugoslavia", issued by "Kava Hag d.d. ", Zagreb, 1939. 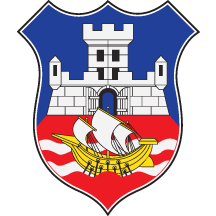 Stylization of Belgrade arms, used as coat of arms until 1991.